Rare that we see a image of a South African Victoria Cross recipient in action, but this is one such image. Flying this exact Avro Lancaster bomber is a Natal lad, Squadron Leader John Dering Nettleton VC. 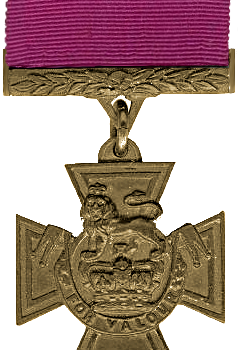 He is another true South African hero and recipient of the Victoria Cross (VC), the highest and most prestigious award for gallantry in the face of the enemy that can be awarded to British and Commonwealth forces. 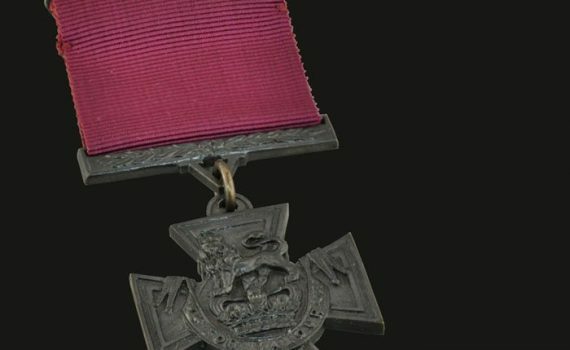 His VC was one of three awarded to South Africans in World War 2 and this is his story. 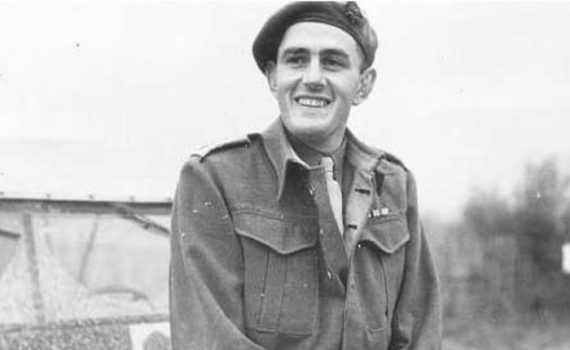 John Nettleton was born on 28 June 1917 in Nongoma, Natal Province, South Africa, the grandson of Admiral A T D. Nettleton, he was educated at Western Province Preparatory School (WPPS) in Cape Town from 1928-30, Nettleton served as a Naval cadet on the General Botha training ship and then for 18 months in the South African Merchant Marine. He took up civil engineering, working in various parts of South Africa. Commissioned in the Royal Air Force in December 1938, he then served with Nos. 207, 98 and 185 Squadrons before joining 44 (Rhodesia) Squadron flying the Handley Page Hampden. He took part in a daylight attack on Brest on 24 July 1941 and in a series of other bombing raids and was mentioned in dispatches in September 1940. .In 1942 a daylight bombing mission was planned by RAF Bomber Command against the MAN diesel engine factory at Augsburg in Bavaria, responsible for the production of half of Germany’s U‑boat engines. It was to be the longest low‑level penetration so far made during World War II, and it was the first daylight mission flown by the Command’s new Avro Lancaster. Squadron Leader Nettleton was the leader of one of two formations of six Lancaster heavy bombers detailed to deliver a low-level attack in daylight on the diesel engine factory at Augsburg in Southern Germany on April 17th, 1942. The enterprise was daring, the target of high military importance. To reach it and get back, some 1,000 miles had to be flown over hostile territory. Soon after crossing into enemy territory his formation was engaged by 25 to 30 fighters. A running fight ensued. His rear guns went out of action. One by one the aircraft of his formation were shot down until in the end only his and one other remained. The fighters were shaken off but the target was still far distant. There was formidable resistance to be faced. With great spirit and almost defenceless, he held his two remaining aircraft on their perilous course and after a long and arduous flight, mostly at only 50 feet above the ground, he brought them to Augsburg. Here anti-aircraft fire of great intensity and accuracy was encountered. The two aircraft came low over the roof tops. Though fired at from point blank range, they stayed the course to drop their bombs true on the target. The second aircraft, hit by flak, burst into flames and crash-landed. The leading aircraft, though riddled with holes, flew safely back to base, the only one of the six to return. Nettleton survived the incident, his damaged Lancaster limping back to the UK, finally landing near Blackpool. His VC was gazetted on 24 April 1942. 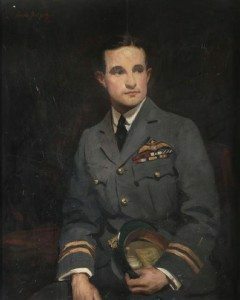 Nettleton died on 13 July 1943, returning from a raid on Turin in Italy by 295 Lancasters. His Lancaster took off from Dunholme Lodge and was believed to have been shot down by a fighter off the Brest peninsular. FW 190s of 1./SAGr.128 and 8./JG 2 scrambled from bases near Brest in the early hours of 13 July, and at 06:30am intercepted the bomber stream. A total of eight bombers were claimed, and at least three Lancasters were almost certainly shot down by the German fighters, one of whom was Nettleton. His body and those of his crew were never recovered. All are commemorated on the Runnymede Memorial. 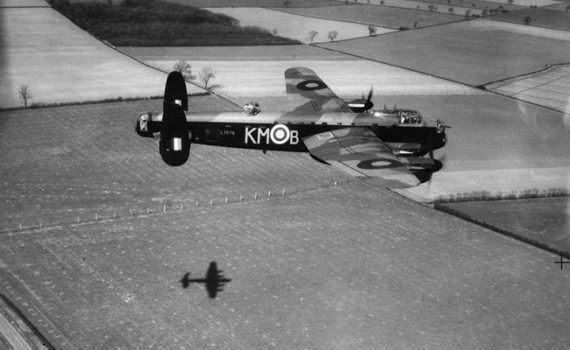 The image shows the Lancaster B Mark I, L7578 KM-B, of No.97 Squadron RAF, piloted by Squadron Leader J D Nettleton of No. 44 Squadron RAF, flying at low-level over the Lincolnshire countryside during a Squadron practice for the low-level attack on the M.A.N. diesel engineering works at Augsburg, which won Nettleton the VC. The squadron repainted the aircraft with Nettleton’s unit code-letters. Image copyright – Imperial War Museum. Story for the South African Legion by Peter Dickens. Reference wikipedia.